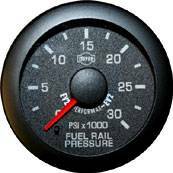 ISSPRO has been engineering and building diesel instrumentation for over 60 years. ISSPRO's EV2 Series matches your OEM gauges right down to the color, lighting and fonts. They utilize a microprocessor-controlled stepper motor movement for the most accurate readings. They also feature a 270 degree sweep and are illuminated with crisp LED lighting. EV2 gauges are also all electric, so there is no need for amplifier boxes. This improves accuracy, reliability and makes installation easier than ever. All EV2 gauges include the items necessary for typical installation. 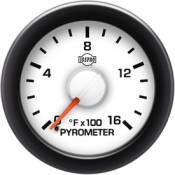 Pyrometers include a 10' lead wire and a 1/8" NPT thermocouple with weather pack connectors. Boost and Temperature gauges include the sensors and wire harness to connect from the sensor to the gauge. A lighting harness is also available as an EV2 accessory to adjust gauge lighting levels. The lighting harness can also be installed so that gauge lighting can be coordinated with the dash panel via the vehicle's dimmer control. Description: 2-1/16" EV2 Boost Gauge; 0-60 psi, Full Sweep White Face, Red Pointer, Black Bezel. For #2 Turbo on twin turbo setup.